Experience the feeling of freedom that comes from the purity of the classy white large flowers with a cream base of Easy Spirit. The perfectly formed buds and flowers hold their beauty throughout the life of the flower, making them great for enjoyment as a bouquet. As a member of the tough as nails Easy-To-Love rose collection, you know you can expect 'NATURAL DISEASE RESISTANCE'. 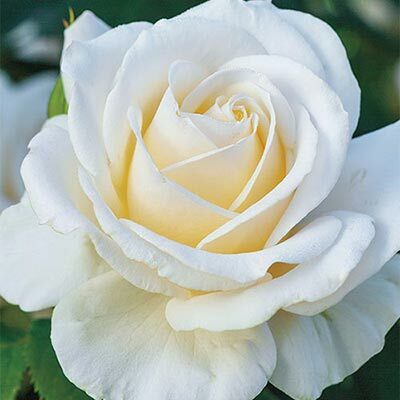 Across the USA, from East to West and North to South, Easy Spirit has shown strong resilience to rose diseases. That means you will be feeling very relaxed and stress-free as you won't have to work hard to express the full blooming potential and create an impact in the garden. The upright compact plant with clean glossy green foliage is the ideal backdrop to the non-burning & long-lasting cream flowers. Now seize the day and see life on the brighter side - the Easy Spirit side!